Earlier this year, I was able to visit Kings Dominion and check out Intimidator 305. Shortly after, I paid a visit to Carowinds to check out Intimidator. After riding both coasters, I felt a review of the dueling Intimidators would be a great idea, considering both coasters are steel marvels with their pros and cons. Let’s start with Intimidator 305. Intimidator 305’s name is derived from two different things: it’s theme and it’s height. I’m not much of a Nascar fan, but I believe Dale Earnhardt was known was “The Intimidator”. Intimidator 305 is the first Giga coaster (over 300′ tall) to be built in the state of Virginia. It’s highest point is 305 feet, thus the name Intimidator 305. I really liked the ride. It’s fast, it’s intense, but I can’t say anything about it being smooth. Towards the front wasn’t too bad of a ride, it wasn’t smooth like a brand new B&M. The back? I felt like I was having my spleen ripped out because I was being jerked around so much. I’d rather ride Grizzly for that feeling. One thing I really disliked about i305 is the gray out effect (when your vision fades out because your body cannot handle the g-forces). I literally missed the first half the ride because of it, even riding front and back. I really liked the theme and set up of the area the ride was built in compared to Carowinds. The area Intimidator was built in is very close in proximity with the rest of the park, while the area for i305 is some-what off the beaten path and just felt a lot less congested. My absolute favorite thing about i305 was the fact you can get up close and personal with the ride. By that, I mean when you get off the ride, or walk up the exit, you’re right by the track and you’ve got great opportunities to get photos of the ride, while Intimidator doesn’t offer close spots to take photos of the ride. Intimidator, also derived from the Nascar legend, Earnhardt, is a completely different coaster from Intimidator 305 in it’s sister park, Kings Dominion. 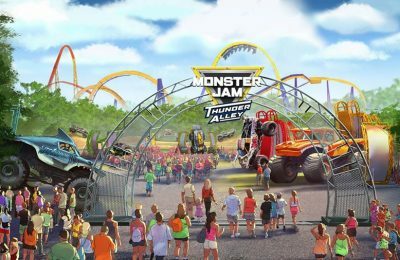 While Cedar Fair is known well for adding the same attractions in several parks, both of these rides share a similar theme, but are two completely different rides and experiences. Intimidator is a B&M coaster, only 232′ feet tall, this coaster’s got a lot to pack. For starts, it’s built by the top of the line (by top of the line, it’s like a Ferrari compared to a Nissan) coaster company currently in exsistance. While I only rode one time (in the back row), I must admit that this was the first brand new B&M coaster I’ve ever been on that wasn’t as smooth as glass. While some parts of the ride felt a bit bumpy, the ride is very smooth and doesn’t jerk you around a whole lot. 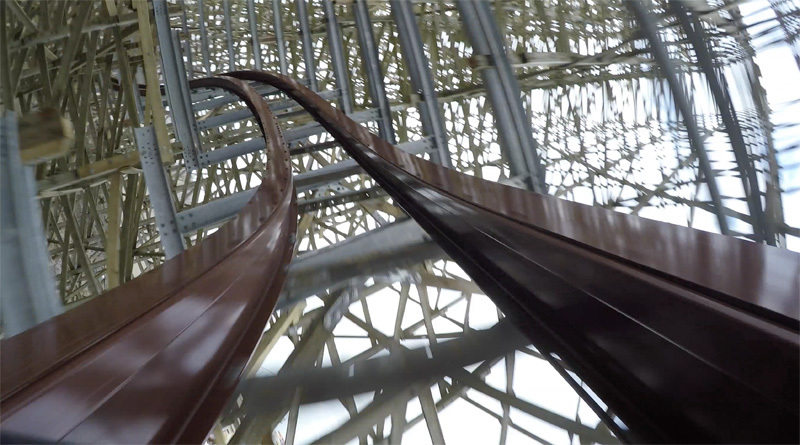 The area is very similar to the one at Kings Dominion, but it’s a lot closer to the rest of the park and there’s not a whole lot of chances to get any close up shots of the coaster (unless you’ve got a decent zoom on your camera). During our visit to Kings Dominion and Carowinds, Intimidator had the longer of the wait, which show’s it’s popular amongst guests in the park (almost five times the amount of time we waited for i305). I305, however, had a 5 minute wait on a busy Saturday afternoon. I don’t think I have so say much. The outcome? While they are both great coasters and I enjoyed riding them, I say Intimidator wins the duel of the Dueling Intimidators.